Cover crops can be terminated with a roller-crimper, creating a weed suppressive mulch. A cover crop can suppresses weeds by reducing light availability to weeds and by releasing allelochemicals (which inhibit the growth of other plants) during cover crop residue decomposition. High cover crop biomass production is the key to achieving season-long weed suppression from a cover crop mulch. Cereal cover crops can achieve high biomass production but have limited value for early-season nitrogen release, while legume cover crops can provide substantial nitrogen release but often do not provide season-long weed control. Using a cereal and legume cover crop mixture can simultaneously provide nitrogen and suppress weeds. Early fall cover crop establishment into a conventionally tilled seedbed using a grain drill can aid in achieving high cover crop biomass. Two years of research at the Sustainable Agricultural Systems Lab (Beltsville, MD), North Carolina State University (Kinston and Salisbury, NC), and the Rodale Institute (Kutztown, PA) resulted in high cover crop biomass production from a mixture of cereal rye (90 pounds per acre) and hairy vetch (12 pounds per acre) seeded early using a small grain drill (Table 1; Figure 1). Cover crop seeding would cost approximately $60 per acre. The nitrogen content of the cover crop ranged from 85 to173 pounds per acre across the sites (Table 2). Cereal rye dominated cover crop biomass in the mixture at all sites (Table 2). Hairy vetch contributed more to overall cover crop biomass in the Kinston environments, which had low nitrogen carryover from previous management (Table 2). Cover crop termination was targeted for soft-dough stage for the cereal rye and 100 percent flowering for the hairy vetch. At several sites we experienced good success planting corn into a cover crop that was terminated one to three weeks before planting. This may be attributed to cleaner slicing through the cover crop mulch by the planter due to dry down of the cover crop between termination and corn planting. Soil moisture can also be replenished when planting is delayed following cover crop termination. Recommendations differ about when to terminate cover crops via roller-crimping, and successes have occurred with terminating the cover crop both before planting and at planting. Extensive cover crop regrowth between the first and second cover crop roller-crimping events was not observed in most sites. At the Kinston 2013 site, we did observe some cover crop regrowth and a second roller-crimping event occurred at corn spiking. Table 1. Cover crop management and corn planting for each site. Table 2. Cover crop biomass and N content. * Note: Cover crop biomass was not separated by species at the Kinston 2013 and Salisbury 2013 sites. Figure 1. Roller-crimping a cereal rye (90 pounds per acre) and hairy vetch (12 pounds per acre) cover crop mixture one week before corn planting. Planting into heavy cover crop biomass can be a challenge for some organic producers. The lead researchers in this project have been continuously modifying no-till planters to create a planter design that will plant reliably and efficiently into heavy cover crop biomass. Current planter modifications include both heavy-residue slicers and Yetter residue managers (Yetter Profitable Solutions, Colchester, IL) mounted to an added front toolbar (Figure 5). When planting conditions do not allow for a clean slice in the cover crop residue, the residue must be moved from the crop row with the Yetter residue managers to ensure good seed-to-soil contact (Figure 6). 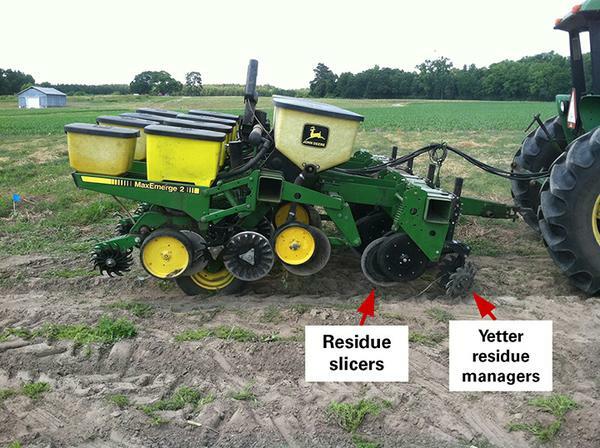 When planting conditions permit, the Yetter residue managers can be raised, allowing for minimal movement of the cover crop residue from the crop row. This minimizes in-row weed pressure (Figure 7). 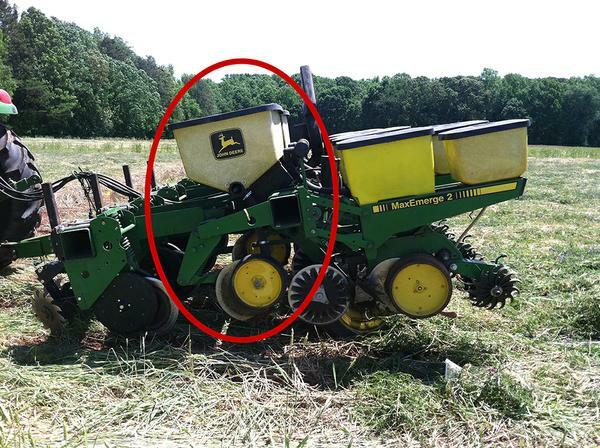 If possible, producers should have a flexible planter design that can provide options for cover crop residue movement depending on planting conditions. Perfect stands were not achieved across these sites; however, stands were better than achieved with previous research in this system. To maximize corn yield, additional fertilizer may be required beyond that provided through cover crop mineralization. Topdressing poultry litter, also known as surface broadcasting, is a popular fertility management strategy for organic corn producers in the Southeast because it is convenient and relatively inexpensive. If topdress poultry litter applications continue to become more regulated due to environmental concerns, producers may be limited to using other organic fertilizer sources and application techniques. Many organic producers still have dry fertilizer hoppers on their planters, and these dry fertilizer hoppers can be utilized to provide starter fertilizer. Loose litter does not flow well from the dry fertilizer hoppers, but pelleted material works well. Organic producers can choose from several pelleted organic fertilizer materials that vary in nitrogen content and price. 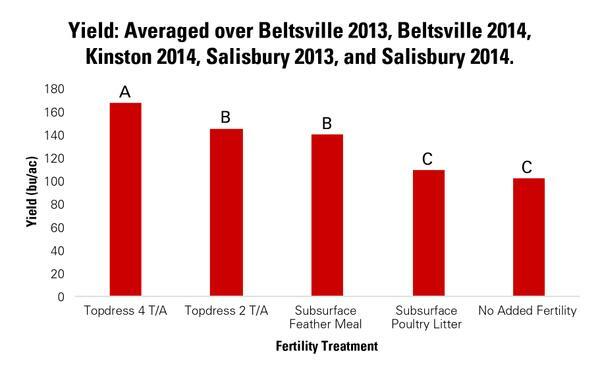 At the Beltsville 2013, Beltsville 2014, Kinston 2014, Salisbury 2013, and Salisbury 2014 sites, corn yield was greatest with the high-rate topdress poultry litter treatment, and was reduced with the low-rate topdress poultry litter treatment and the subsurface feather meal treatment (Figure 9). Corn yield was lowest and similar between the subsurface poultry litter and no added fertility treatments at these sites (Figure 9). Feather meal is an expensive fertilizer source, but did provide yield increases at these five sites compared with adding no fertility. For those producers on a site with moderate nitrogen carryover from previous management and limitations on topdress poultry litter use, subsurface banding feather meal is a viable option for increasing corn grain yield, but the economics of using feather meal may be limiting. The Kinston 2013 site had low nitrogen carryover from previous management, which was reflected in the lower cover crop biomass achieved at this environment (Table 2). Corn yield was greatest with the topdress poultry litter treatment, and corn yield was not affected by the presence or absence of weeds within this treatment (Figure 10). This is likely attributed to high nitrogen provision enhancing the corn’s competitiveness with weeds. In the subsurface and no added fertility treatments at this site, the corn crop was not competitive with weeds, and heavy weed pressure in these treatments adversely affected corn yield (Figure 10). At this site, corn yield did increase with the subsurface poultry litter treatment, which only provided 17 to 19 pounds of nitrogen per acre (Figure 10). Nitrogen typically releases more rapidly from poultry litter than from feather meal. The corn yield increase observed with the pelleted poultry litter treatment compared to the no added fertility treatment can likely be attributed to enhanced corn competitiveness early in the season from rapid nutrient release from the poultry litter. If a producer is on a site with low nitrogen carryover, it is critical to provide adequate nitrogen through starter fertilizer applications to ensure crop competitiveness with weeds and high corn grain yield. Table 3. Starter fertility treatments. * Feather meal source was NatureSafe Blending Base (13-0-0). ** Pelleted poultry litter (3-2-3) was obtained from Perdue AgriRecycle, LLC. Notes: The same cover crop mixture was planted across all fertility treatments. 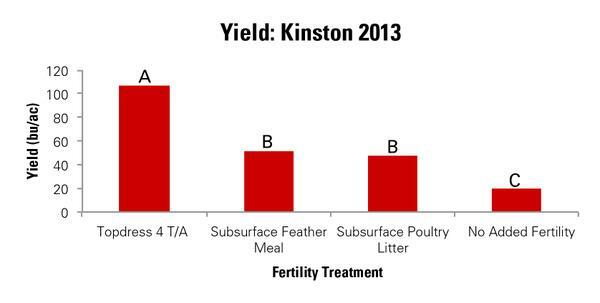 The 2 T/A topdress poultry litter treatment was not tested at the Kinston 2013 site.